It is my opinion that one can never have too much chocolate-hazelnut spread. I keep thinking that one day I'll run out of ways to use it, but so far, no dice. I use it in all the basic ways, like spread on toast and topped with bananas (one of my favorite snacks - yum!) or on crepes, but I also really enjoy baking with it. It makes a great substitute for peanut butter in pretty much any of my recipes, and I like that it's a little more subtle and sophisticated than peanut butter. 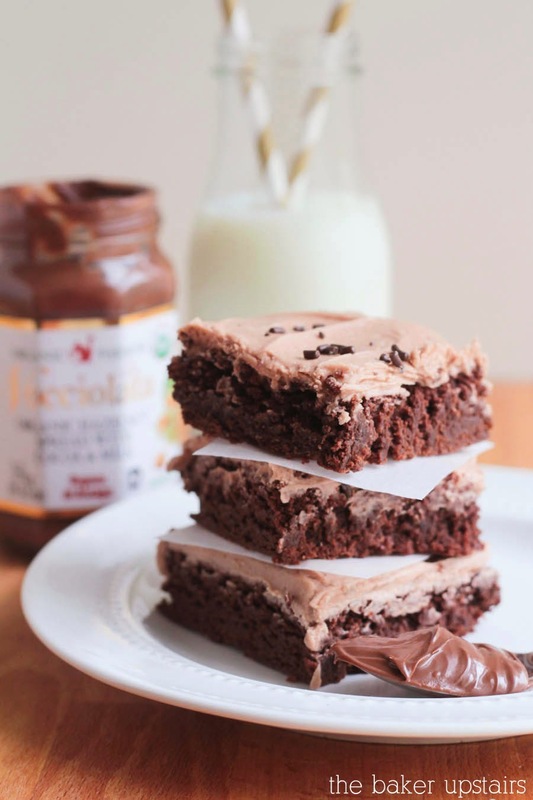 These chocolate hazelnut brownies are one of my new favorite uses for it, and they are delicious! 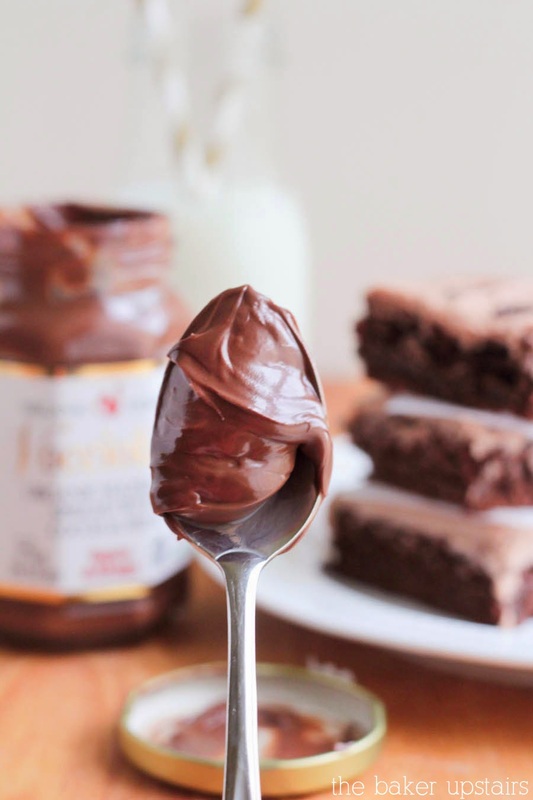 I've tried just about every brand of chocolate-hazelnut spread out there, and I've loved everything I've tried. I usually stick to Nutella, since I can buy it in bulk at Costco, but I also really like the World Market brand, particularly the vanilla swirl kind. These brownies were my first time trying Nocciolata spread, and it was delicious! It's definitely a little different than Nutella, but it tastes great and made for a tasty frosting. If you hate chocolate-hazelnut spread (I know there are plenty of haters out there!) please feel free to substitute peanut butter in the frosting, or just leave off the frosting altogether. The brownies are pretty great just by themselves! 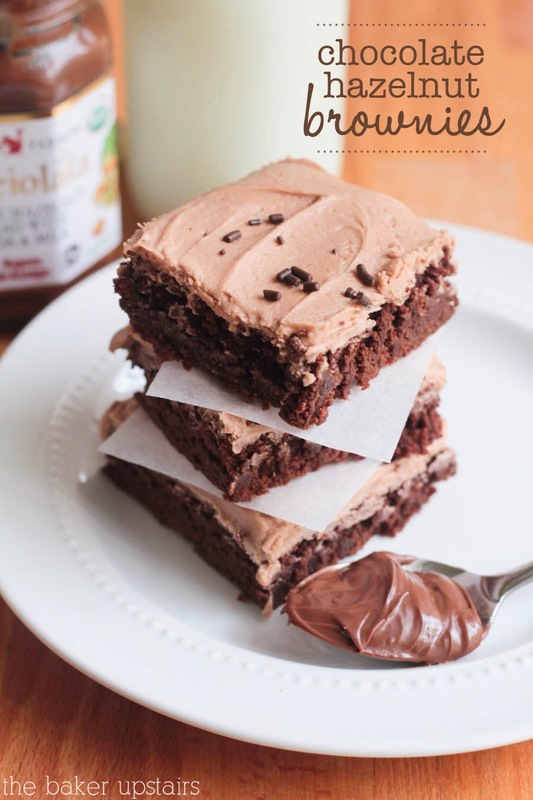 This is my favorite basic brownie recipe, and it’s the one I use the majority of the time. I love that it’s super easy to mix up even without a mixer, and the brownies come out rich and moist and delicious. The only way to make them better is to add some awesome chocolate hazelnut frosting! This frosting is pretty much the best thing ever, and it’s all I can do to stop myself from just eating it with a spoon. Yum! Preheat the oven to 350. Prepare a 9 x 9 or 8 x 8 baking dish by lining with foil or parchment paper. In a large bowl or the bowl of a stand mixer, cream together the butter and sugar until light and fluffy. Add the vanilla and eggs and mix until combined. Add the flour, cocoa powder, baking powder, and salt, and stir until combined. Spread the mixture in the prepared pan and bake 20-25 minutes, or until a toothpick inserted two inches away from the side of the pan comes out clean. Let cool completely. To make the frosting, beat together the butter, powdered sugar, salt, and vanilla until combined. Add the chocolate hazelnut spread and beat until light and fluffy. Spread on the cooled brownies and enjoy!